Noise isolation in interior office partitions is one of the few places in life where the cheaper option sometimes gives better performance. Most people don't realize it, but if you use fewer studs (say, 24" on-center vs. 16" on-center) your wall will exhibit higher sound transmission class (STC). And if you use "floppier" studs, say 25-gauge instead of 16-gauge, then you get even more. That's right: the cheaper construction (fewer, lighter studs) performs better from the perspective of sound isolation. 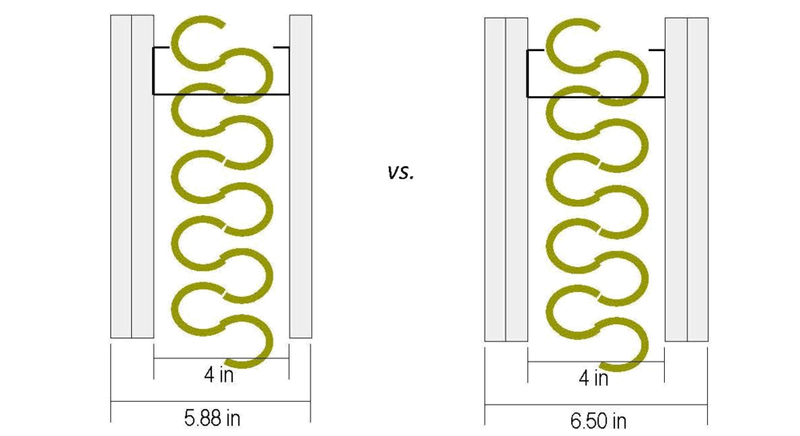 The reason is a bit complicated, but it boils down to the fact that fewer studs imply fewer connections (and therefore fewer mechanical vibrational pathways) between the two sides of the wall, while lighter studs have a bit more "give" to them and act a bit like spring vibration isolators. A four-layer gypsum-board partition, vs. a cheaper three-layer partition. The four-layer one should provide better noise isolation, right? Predicted STC (sound transmission class) for eight different partition construction options. These are from a popular modeling software, so in some places they might be optimistic when compared against acoustical lab test data. Still, the comparison across constructions is probably pretty reasonable. What jumps out is that the cheapest construction (3 layers of GWB on 25-gauge studs @ 24" OC) performs better than the most expensive construction (4 layers of GWB on 20-gauge studs @ 16" OC). The cheapest construction has acoustical isolation performance of STC-53 vs. STC-50 for the most expensive option. While it's true that STC is just a single-number rating system that doesn't allow perfect comparisons, in this case we were just wondering about how many layers of drywall to use. The shapes of the sound transmission loss spectra are practically the same, so a head-to-head comparison of STC is just fine. And even though the above are based on model data (published test data from USG and others differ), I think they're good enough to illustrate this comparison. Like I said, this is the rare instance in which the less expensive construction leads to a better acoustical outcome. See, acoustical consultants aren't always costing your projects money, after all.